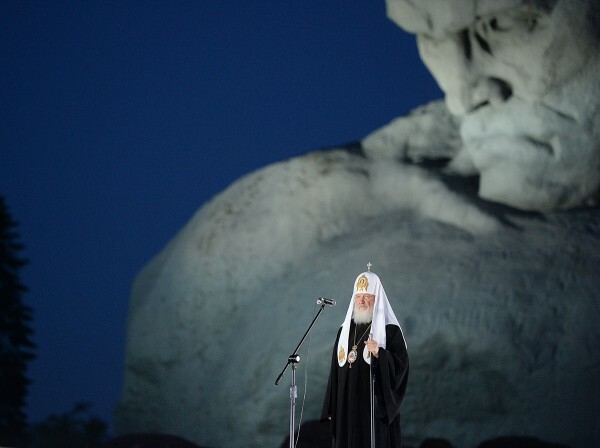 Moscow, June 22, Interfax - Patriarch Kirill of Moscow and All Russia served a service for the repose of the souls of the defendants of the Brest Fortress and all people killed in the war in the early hours of June 22, on the 74th anniversary of the beginning of the Great Patriotic War. “The heroic defense of the Brest Fortress is a symbol of unity, an image of unity and ability to overcome deadly danger and win together,” the patriarch said at a requiem meeting following the service. “We are all one family. And not only because we have the same blood, but also because we have the same history of joy and sorrow. How can we divide this history, how can we divide the Brest Fortress, into what sectors for specific ceremonies to be performed in accordance with the national preferences?” the patriarch said. In memory of his visit to the Brest Fortress, Patriarch Kirill gave the Brest Fortress an image of Our Lady Joy of All Grieving Ones, wishing for our sorrows to be materialized in joy.